227GW, not 175GW, India’s new 2022 renewables target? Power minister said India will “overachieve” renewables target, touch 227GW by 2022 (as opposed to 175GW) with new schemes: floating solar, manufacturing-link solar & offshore wind projects. This surge requires $50 billion more in investments. Thermal power plant developers dread power glut, but government expects “spurt in demand”. India’s current installed capacity is 70GW, while 40GW is under tendering/construction. June 26, Centre will conduct public hearing on probe of safeguard duty on solar imports. The Directorate General of Trade Remedies (DGTR) will probe if solar imports are causing domestic industry “serious injury”. Earlier Director General of Safeguards (now under DGTR), recommended safeguard duty for 200 days. China’s decision to cut support to its solar sector is threatening India’s plan to produce solar panels. 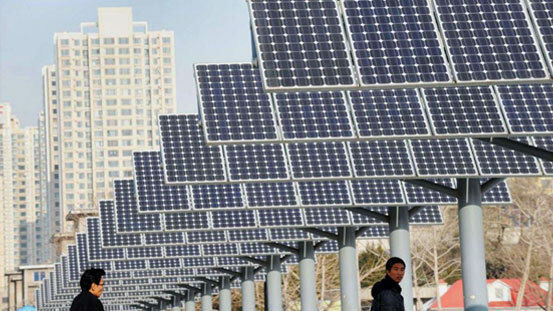 China’s move is expected to create a solar equipment glut in the market, and price crash. India may delay auction to invite bids to build 5GW of panels annually. Experts say, renewable power generation will surge in India as imports get cheaper. Solar module prices are expected to drop 34% in 2018, and 15% in 2019 in the wake of China’s move. Tariffs in India’s next solar auction may fall below the 2.44 rupees/kWh record set May 17, last year. This has made public hearing on 70% safeguard duty in July critical. China’s sudden move “sent solar stocks into a free fall” and prompted analysts to lower forecasts for global solar installations this year amid expectations that a glut of excess panels would send prices tumbling, and thin down profit margins. Giving its 4-yr report card, government said over $42 billion have been invested in renewables sector. “India stands 4th in wind power, 5th in renewable and 6th in solar installed capacity”, govt. said. Solar rose by over 8 times: 2.6GW in 2014 to 22GW, wind capacity increased by 1.6 times: 21GW in 2014 to 34GW. The much-awaited Rs. 1.4 lakh-crore solar pump scheme for farmers, KUSUM, will kick off next month. 2.75 million solar pumps (1 million grid-connected) are set to be provided to farmers. Finance Ministry is yet to allocate the massive amount for the “non-starter” of the scheme. Farmers will have to pay 10% upfront, and 30% in loan to buy solar pumps. Greenko will purchase the solar and wind portfolio of Orange Renewables for about $1 billion. Backed by Singapore’s GIC and Abu Dhabi Investment Authority (US$450m investment), Greenko is the largest green buyout in India. President Trump’s tariff on imported solar panels has led U.S. renewable energy companies to cancel or freeze investments of over $2.5 billion in large installation projects, along with thousands of jobs. Centre approved off-grid and decentralised solar PV application programme under which 3 lakh solar street lights will be installed in the country where there is no grid.